Want to be notified of new releases in coodoo/flowery? Flowery prettifies the result generated by Facebook Flow type check tool, making it easier to read. Before: It's not easy to understand which part of the code went wrong. After: Each error was listed with related file name and precise locations. There are 3 ways to run flowery. By running one of those commands, flow will check all js files in the folder, pipe the results to flowery, then you will see prettified results on screen, also a file named flow-results.txt will be generated in the project folder too so your build tool could pick up from there and make further use of it. 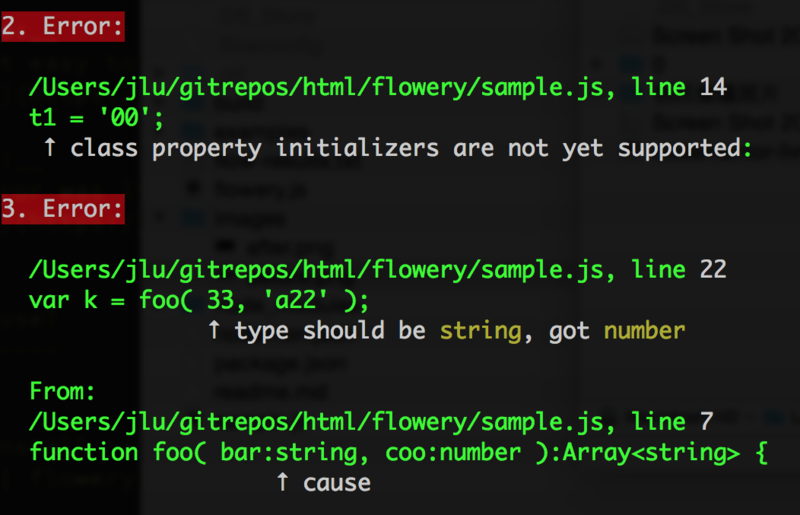 As a side note, flowery can be invoked via both CLI or API, see example/api.js for usage guide. The core api returns both arrErrors and arrMessages so you can further integrate with other toolchains, for example, build a better flow linter for Sublime Text Editor. Flowery is written in ES2015, hence it's required to run build to generate ES5 version before publish on NPM.